CP Piston MX Series piston kits are fully boxed-style piston forgings with a skirt coating. The wrist pin has a Diamond-Like Coating (DLC) that is harder then steel, ensuring durability unsurpassed by any other pin on the market today! These kits include the piston, wrist pin, locks, and rings. CP Pistons use X-forgings to minimize friction and weight without compromising strength. Double pin oilers add twice the amount of oil from the cylinder wall to the wrist pin. Radiused domes are use to maximize quench, while eliminating possible hot spots that promote detonation. 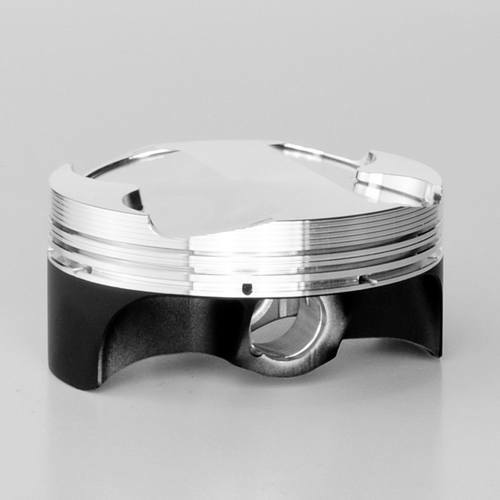 The MX piston kits have a V-shaped groove machined into the second ring to collect excess blowby between the top and second ring. This groove is known as the accumulator groove.